The Friends of the Carrs grew out of the direct action taken by a number of local residents in 2004/5 to prevent the Carrs Car Park from being taken over by office workers parking for the day. The problem became so bad that there were no spaces for genuine users of the park, the playground or the Parish Hall. As a result, the Action Group physically blocked the access to the car park for all those who were evidently not using it for the correct reasons, and this high profile action brought the matter to the attention of Macclesfield Borough Council (MBC). The Friends of the Carrs was formed at a meeting in the Summer of 2005, which was held in the Parish Hall. The open meeting was called by Macclesfield Borough County Council, and was attended by about 50 people. Though the meeting was intended to deal with parking, it became evident that MBC were interested in forming a group of local residents to help with the running of the Carrs Park, and to act as a communication channel between the residents and MBC. At the original meeting, it was agreed that an ad-hoc committee should be set up in order to get things moving. The committee was not properly elected, but consisted of the group at the meeting who showed the greatest interest in getting the Friends of the Carrs up and running. The original intention was to hold an AGM within the year and formally elect a Committee to act on your behalf. It soon became evident that this intention could not be met for a number of reasons, but the Committee were not idle during the 18 months that they steered the group before the First Annual General Meeting in September 2006. Liased with MBC regarding a number of issues that arose during the period. During the start up period, the Committee also arranged three open events. In February 2006, they organised a River Clean Up, attended by 46 members of the general public. Two skips were filled up with 12 shopping trolleys, 3 bikes, an assortment of roadworks signs and traffic cones, and much more. 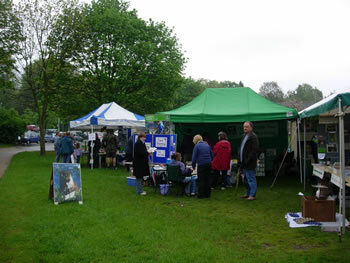 In May, they arranged a Nature Day attended by over 800 visitors. The event was inter-active so the general public could get really involved in the exhibits, and learn more about the benefits of this wonderful nature reserve in our back yard. In June, there was the first Balsam Bash, which was the beginning of the on-going programme to remove the Himalayan Balsam and other invasive weeds from the Carrs as an annual event. The Friends of the Carrs has moved on from those early days, but the Committees that have and will follow will undoubtedly get inspiration from those that originally set up the group from scratch.